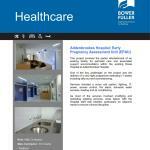 This project involved the partial refurbishment of an existing facility for perinatal care and associated support accommodation within the existing Rosie Hospital at Addenbrookes Hospital. One of the key challenges on the project was the delivery of a very tight programme extending 11 weeks including strip out and commissioning. Services included a nurse call system, lighting, IT, power, access control, fire alarm, domestic water services, heating and air conditioning. As most of the services involved modifying and extending existing services, close liaison with the Hospital staff was needed, particularly on adjacent wards to ensure minimal disruption.